Learn from the pros. Airport travel tips and tricks to make your travel jaunts easier to handle. The perfect read while you wait for your next flight! Discover the best places to shop athleisure clothing at airports around the world. Just browsing these calming stores is enough to zen you out in a busy airport. To prep you for a healthy travel year, we’re sharing this year’s biggest airport wellness trends. Here’s everything you need to know to travel well in 2019. 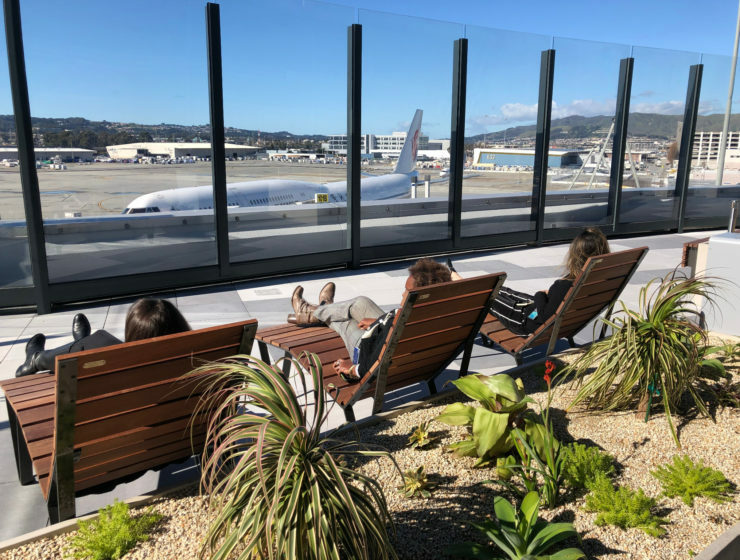 The first post-security observation deck at SFO Airport opened this week. Read how the outdoor terrace can bring lots of health and wellness benefits. Fight travel aches and pains by doing this sequence of 5 simple pre-flight stretches that will help boost your circulation and keep your body ache free. Ever wondered where all the airport showers are hiding? We found 12 Places to Get Naked and Shower away travel fatigue. Save this holiday layover list. Check it twice. You’ll save your holidays if you take our advice! Is your bottle of water half-full or half-empty? Once you have passed Security Control, it won’t make any difference.